Properly used, retractable dog leashes can provide an outlet for dogs that want to run and need more exercise. Retractable leashes are popular because they allow the dog some more speed and freedom than more traditional leashes. The benefit to retractable leashes include the following. Your dog can have greater freedom of movement, which can enrich their walks and overall quality of life. They allow you to exercise a dog that has more energy and wants to move at a faster pace. They are useful for training the recall ("come") command just as you would with a long line. The downside to these leashes are the safety concerns for both the dog and owner. Dogs have been known to run far ahead of the owner. If you are off balance with a larger dog, you may not be able to hold on to the leash securely. The cords can fail, allowing dogs to run ahead and find themselves right in traffic or other dangerous predicaments. Dogs running out ahead that suddenly hit the end of the line can suffer neck and trachea injuries. Too much freedom might allow the dog to run up to other dogs that may be dog aggressive, which can lead to fights. They pose a risk to people and have caused serious injuries. If the cord is taut and you grab it, or it hits open skin, you can severely cut yourself or get major burns. If you are working on teaching your dog not to pull, using a retractable leash can be confusing to the dog. The dog is being asked to walk closely to you on one type of leash where pulling will not be reinforced. He then switches to another leash that promotes pulling. This can be counterproductive since you're giving the dog an inconsistent message. One option is to train the dog with a cue for each behavior, but you may find this more difficult if you are not yet skilled with training. Alternatively, you can wait until your dog is fully trained to walk nicely before introducing the retractable leash. There are several lengths of retractable dog leashes, though 16 feet is most common. They also come in a variety of widths and materials. Narrow leashes are appropriate for small dogs while wider leads are for larger breeds. Most manufacturers give recommendations for specific dog sizes on the packaging. Dogs that have mastered basic obedience behaviors are safer on retractable leashes as you can call them back to you if they get too far ahead. An untrained dog may lunge on the leash to chase something and you could easily get pulled over if you're not paying attention. High energy dogs can do well on retractable leashes with the caveat that they already have training. The freedom of the leash will help them burn off more energy and they can sniff to their heart's content, giving them additional mental stimulation. "Never use a retractable leash with a dog that has aggression issues in a location where you might run into another person or dog," says Certified Dog Behavior Consultant Adria Karlsson, MAT, EdS, CDBC. If the dog is 16 to 20 feet away from you, it is more difficult to have control of a possible incident. If a retractable pet lead becomes sluggish or shows signs of fraying, the winding mechanism may be off-balance and fail to rewind properly. Replace the leash in this situation. If the cord or ribbon becomes wet, leave it open (not retracted) until it's dry to prevent mildew and decay. When looking at purchasing a retractable leash, make sure that the size is appropriate for your dog's weight range. A leash that's too small won't be very effective in holding your dog in place. 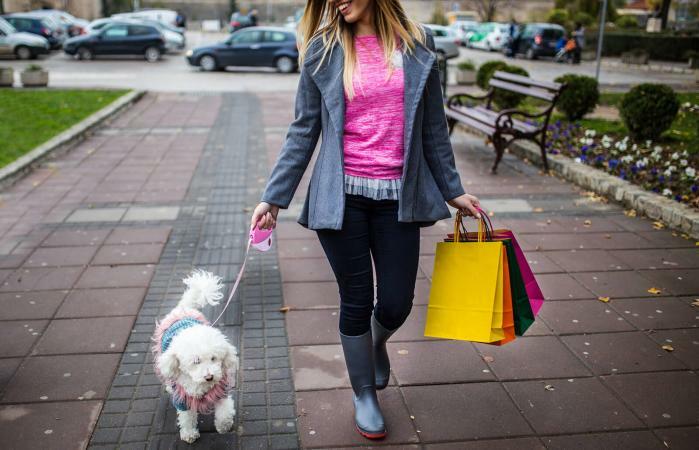 Avoid wearing shorts or clothing that leave parts of your leg exposed to avoid any injuries if the leash touches your skin and the dog lunges. Pay attention to your dog at all times. Don't talk on a cell phone or be otherwise distracted. This is true of all leashes but especially with retractables as your dog is farther away. At a minimum, train your dog to come when called and to sit or stop when asked. This allows you to avoid any potential issues such as chasing a squirrel or running into the street. A "leave it" behavior is also useful in case your dog comes near some appetizing item they should not eat. Though retractable dog leashes are convenient and give both dogs and owners greater freedom and control, they must be used properly to be effective and safe. Make sure you weigh the pros and cons, as well as your dog's size, personality and level of training before deciding to get one.